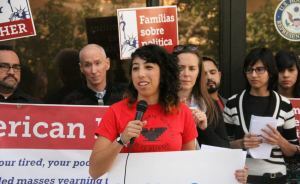 A day after President Obama announced he would grant deportation relief to over 5 million immigrants, the Kern County Coalition for Citizenship held a press conference for local organizers to respond to the plan. Some applauded the decision, such as one DACA recipient who said, “Today’s action brings tears and joy and sighs of relief for many families and I’m grateful for the President keeping his promise and the promise of America: to have a shot at a better life.” Others were more cautious, saying the action falls short of comprehensive immigration reform, which requires participation from Congress. “It’s a step in the right direction in protecting those who have been here longer than five years or with children who are citizens, but there continues to be a strong focus on enforcement and making sure the border is safe, even though there are less crossings.” More information and commentary on how immigration advocates and families are responding to the President’s decision, on South Kern Sol. This entry was posted on December 2, 2014 by Editor in Print, South Kern Sol and tagged Community organizing, Deferred Action for Childhood Arrivals, Deportation, Family, Immigration Reform, Law enforcement, Politics.